Antioxidants And Green Tea | Your Health. Your Lifestyle. Blueberries are among the antioxidant super foods. These chemical compounds reduce the free–radical damage that can compromise your immune system and lead to infections as well as degenerative diseases. Taste the rainbow: Colorful fruits and vegetables are rich in vitamin C, vitamin E, and beta carotene, which are great sources of antioxidants. Add fruit to your breakfast: Top whole grain cold and hot cereals with strawberries, blueberries, or raspberries. Snack healthier: Keep fruit at your desk. Granny Smith, Gala, and Red Delicious apples are great choices as well as plums. Add lemon: Squeeze lemon in your iced tea, green tea, water, or on top of dinner dishes to help with the absorption of antioxidants during digestion. Herbal tea: With zero calories, tea can be filled with antioxidants that may help prevent cancer and heart disease. Try green, mint, chamomile, or black. Sweeten with a dash of honey or add flavor with a twist of lemon. Hot cider: Pasteurized ciders can be laden with calories, but it’s easy to make your own lower–calorie version by simmering a pot with fresh orange juice, lemon, cloves, and cinnamon (the spices are loaded with antioxidants and minerals). Mulled wine: Red wine has powerful antioxidants; when combined with spices like cinnamon and cloves, it can warm you up and help keep you healthy. To cut back on calories, substitute half the wine with tea or low–fat cider. Coffee: Black coffee is low in fat and calories, high in antioxidants. To add a little zip, pour in low–fat milk and sprinkle with cinnamon and nutmeg. Try to limit your daily caffeine dose, though, to 300 mg (about 3 8–ounce cups). Hot cocoa: Make a healthier version using low–fat milk, or spice it up with nutmeg, chili powder, and cinnamon sticks. We already know that the plant chemicals in tea called polyphenols are proven risk-reducers for cancer and may also offer similar protections against heart disease and dementia. And a plant chemical in green tea called EGCG (epigallocatechin gallate) may also help you lose weight. But beautiful skin? Yep. Researchers divided 60 women into two groups and gave one of them green tea beverages for 12 weeks. The green tea group saw significant improvements in roughness, scaling, elasticity and blood flow to the skin. “In summary”, wrote the researchers, “green tea polyphenols delivered in a beverage were shown to protect skin against harmful UV radiation and helped to improve overall skin quality of women”. So drink up! Studies show black rice bran to be higher in anthocyanin antioxidants than blueberries, which traditionally steal the spotlight for their antioxidant properties. The plant pigment, which gives the grain its signature color, may reduce your risk for heart disease and cancer and reduce levels of LDL (bad cholesterol) in the blood. For as long as I can remember, I’ve sipped tea for the bond it built with family and its bevy of halth benefits. Join me for a cup! While sipping my ice tea during the heat of summer one day, I realized I had been drinking this beverage in some form or another for most of my life. Ad a child, I loved tea with milk and sugar. Today, I drink my tea iced or black, green or fennel and drizzled with a spot of raw honey. Made form the camellia sinensis plant, tea started out as a healing beverage and was often used medicinally to treat illness. According to Chinese legend, it is thought that tea was discovered after Shen Nung, an ancient Emperor and healer, found a leaf from the plant had fallen into his boiling water and that he enjoyed it. Today, tea is said to be the second-most commonly consumed beverage in the world, behind only water. I always remember the words of my grandmother, who educated me on the benefits of drinking tea. On those special afternoons when I visited my Oma in Holland, she would make a pint of stopping whatever she was doing to enjoy her favorite cup of tea. She used to say with such enthusiasm, when I drink tea, it completely revives me! It’s a pleasant habit I still share today with my own mother when she comes to visit me. I only help I can spend as many happy hours with my own daughters. But the fact that tea imparts a reviving effect is valid, since the leaves from the camellia sinensis plant contain numerous antioxidants and phytonutrients. Tea also provides a hydrating effect if you follow my personal two-handed rule: With a steaming mug of tea in one hand, you must chase it down with one and a half times as much water. Is tea better than coffee? Brewing a cup of tea versus a cup of coffee can be a conflicting decision. It may come down to taste preference and time of day. Many people will start their day with a cup of coffee and switch to tea in the afternoon. Both contain caffeine, which delivers a stimulating effect to the central nervous system. Many prefer the less-jittery effect of tea. One eight-ounce cup of black coffee contains somewhere between 95 and 200 milligrams of caffeine, while a similar amount of black tea contains 40 to 120 milligrams. I love to start my day with a cup of coffee made with my French press. Later on, I enjoy chamomile Herbal Detox Tea by Arbonne or my absolute favorite, fennel tea. I know green tea is good for so many reasons, but unfortunately I get a severe case of the jitters when I drink it, so I need to be careful to not have too much. I have heard of recipes that contain green or Earl Grey tea as an ingredient. Can I use tea this way, and do you have a recipe using tea? Lately, teas have been incorporated into the cooking of many popular chefs. I’m not a chef, but I too have used tea in my cooking. I especially like the herbal teas that are fragrant and aromatic because they deliver a unique depth of flavors, particularly in baking. You’ve heard that tea can lower risks for developing cardiovascular disease and cancers, bolster immune responses, and strengthen bones and teeth. But at this time of year, who wants to cradle a hot cup? Fortunately, the iced version — which got its start on a balmy summer day at the 1904 St. Louis World’s Fair — is just as potent as its warmer counterpart. Infuse invigorating ingredients. Mix pureed or fresh whole raspberries and ground mint leaves into your tea for a crisp, tangy punch. 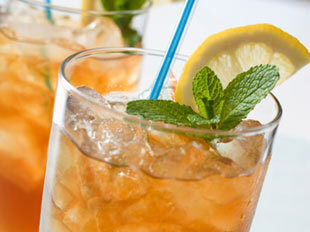 Add a citrus splash by mixing it with a little orange juice and fresh lemon wedges. Homebrewed or store-bought? Prevention Magazine reports that homebrewed tea has more antioxidant strength than powder or bottled versions. However, even the convenience brands (such as Nestea Liquid Concentrate™ and bottled Lipton Iced Tea™) perform better than Concord grape juice — a proven free-radical fighter. And fridge-brewed tea comes out on top of the heat-and-cool alternatives. Enjoy all color concoctions. Some studies show that green tea may reduce cancer growth, combat germs, and improve cholesterol levels. Black tea may boost the immune system and block cancer-causing DNA damage. White tea may prevent cellular breakdowns that contribute to skin cancers. Even chamomile, known more for its soothing effects, may help level out blood sugar. The Chinese have sworn by its healing powers for more than four-thousand years. Now, green tea is gaining ground in the United States by proving it’s more than an ancient tradition. Green tea may be a strong weapon in the fight against cancer. When Arnold Aronson’s prostate cancer came back, he was ready to try anything to get rid of it. His urologist, Dr. Mark McClure, suggested drinking green tea. “There’s good scientific evidence to show that green tea does help decrease the incidence of certain cancers and can actually cause death of certain cancers,” says Dr. McClure. He recommends drinking six to nine cups of the stuff each day. Pam Armstrong is an herbalist. “I think every human being’s greatest fear is cancer. Certainly if drinking green tea on a daily basis can help prevent cancer, who wouldn’t try it?” she asks. Green tea is one of the hottest selling herbs on the market these days in both loose leaves and capsules. However, there is a down side to drinking green tea. It has caffeine and a unique taste. Although green tea has not been proven to stop cancer growth, Arnold is a believer. His cancer growth has slowed down. “I feel like a million dollars, and I’m 78 years old,” he says. 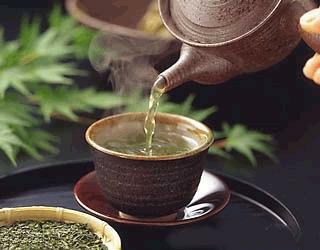 In addition to helping fight cancer, green tea may also help in the prevention of heart disease. To find out if green tea is right for you, be sure to discuss it with your doctor.